Visit Orkney if you can. Our neighbours across the firth are lovely with a distinctive accent quite different from our own. We share a very long colourful history as trading partners and friends. If you only have time for a short visit then the organised day trips are best. 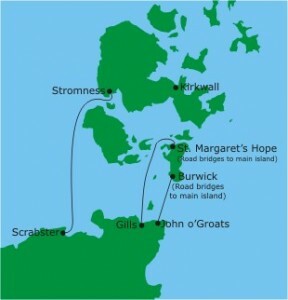 If you want to take your car, to get the most out of a day trip I would take the Gills Bay/St Margaret’s Hope ferry over to Orkney, follow the route Kirkwall, Maes Howe, Ring of Brodgar, Skara Brae, Stromness and take the Stromness/Scrabster ferry back. This maximises your time on Orkney allowing you to see more of each site and more than you would see if you only took one ferry. For timetables and further information click on the pictures. For cars and foot passengers. The easiest to get to by public transport. Good for views of the “Old Man of Hoy”. Don’t forget to take photographic ID. For cars and foot passengers. This is the quickest route. For foot passengers. Provides bus tours of Orkney.